Greek American inventor Steve Katsaros and his company Nokero are changing people's lives around the world. For Steve Katsaros, it all started with a nagging idea. Walking by a construction site one evening, he noticed a rope of construction lights all drawing power from a chugging, polluting generator. Immediately, a question came to his mind: Was it necessary? The next day, he went home and sketched a simple but elegant solution to the problem: a solar-powered light bulb. Four days later, he had a patent application in hand. The bulbs he designed — which run on batteries powered by photovoltaic cells and shine for up to seven hours per charge — last three years and pay for themselves in a few weeks. It's not often you hear of a great new invention that will have a positive impact on the lives of billions while not harming our already damaged and extremely sensitive environment. But that's exactly what one Greek American achieved when in 2010 he came up with a bright idea - a simple, portable solar light bulb with the potential to revolutionise life for the 1.4 billion people in the world who live without access to electricity. Since then the Colorado-based Steve Katsaros has been travelling the world, mostly to remote villages in Asia and Africa, to show people just how important his discovery is. Nokero is the only solar company to win the United States Patent and Trademark Office's Patents for Humanity Award. With over 1 million lights distributed in over 120 countries, Nokero is a catalyst for economic and community growth. Five months after that initial sketch, Katsaros launched Nokero, a for-profit company with a mission to provide affordable solar technology solutions for poor, off-grid communities around the world. Nokero is the only brand of its kind with the usage of state-of-the-art solar light bulbs and two mobile phone chargers currently distributed internationally in over 100 countries across the globe. The company promotes education surrounding the solar industry, as well as the increased benefit of safe lighting, which include health, income and community. Nokero's durable, weatherproof, long lasting lights encourage productivity at all hours without the use of fires or dangerous fuels such as kerosene. Nokero, which comes from NO KEROsene, aims to be the number one leader in low-cost consumer solar products in the world. 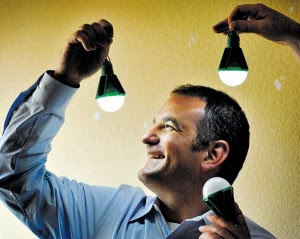 The company says that by removing current light sources such as kerosene, along with other harmful, expensive techniques, they can produce a world that promotes safety, an environmentally-friendly environment, and the ability to live life in a new hope. "Selling solar lights is how we're going to change the world," says Katsaros, who founded Nokero to market his invention. Most recently, Nokero quickly shipped all its existing inventory of solar lights to Nepal following the tragic earthquake that struck the country and Katsaros, and his company continues to seek new ways to help the tens of thousands of Nepalese are living without electricity and safe lighting.